The professional choice for interior work and renovation. The FEIN angle grinder series. the name for professional belt grinding. Stationary belt grinding machines for metal processing and finishing applications. Best work progress. Outstanding service life. The optimal drilling solution with high powered German motor designed for use with Carbide and HSS cutters for toughest jobs and applications. Get a FREE pilot pin! Buy a standard size Slugger by FEIN cutter. Highest quality annular cutters on the market. We invented the oscillating power tool in 1967. We have now been consistently further developing tools and accessories for almost 50 years and so have the most comprehensive system for interior work and renovation on the market today. FEIN invented the world’s first power tool. Wilhelm Emil Fein founded the company in 1867. 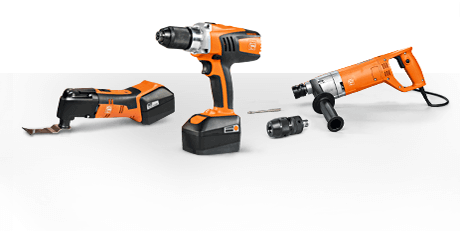 FEIN invented the first power tool – the electric hand drill – in 1895. Today FEIN is a long-established power tool manufacturer with an international reputation. This first-class German manufacturer develops and produces application solutions for the metalworking, interior construction, and automotive sectors and is the specialist for professional and extremely reliable power tools for industry and trades. FEIN. Extremely reliable power Tools.